Now with Snake built in! If I were to tell you that there’s a new console on the horizon with games from Sega, Namco, Capcom and EA confirmed, you’d be pretty excited, right? Now what if I told you that they were games initially designed to be played on a mobile phone? Less excited? I thought as much. 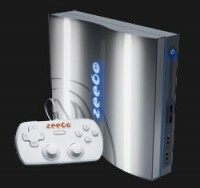 Zeebo will be the first fully-fledged console from the infamous Brazilian company TecToy, and is due out in Brazil in April 2009 and then worldwide in June 2009. The games themselves all appear to be conversions of recent mobile phone games, and are stored on the 1GB of internal memory. Six come pre-installed – including Quake and Prey: Evil – and another ten have been announced, such as Ridge Racer, Sonic Adventure, Crazy Taxi, Resident Evil 4 and Crash Nitro Kart, while downloadable Mega Drive games have also been mooted. You can see the full catalogue on the Zeebo website, and there are also a few videos on YouTube like this one and this one. The console itself resembles a shinier PlayStation 3 with a glowing blue logo, while the controller appears identical to the Wii Classic Controller. No internet connection is required – the games are downloaded straight out of the air and can be purchased using Z-Credits, a bit like Nintendo Wii Points. The screen resolution is set to 640×480, which could possibly be a good thing – these games were designed to be played on a screen not much bigger than a postage stamp. You also have to wonder how the previous digital controls will be mapped out onto the analogue sticks. Shoddily, no doubt. This video of Crash Nitro Kart in motion should give you an idea of the 3D capabilities. I think it’s a very nice business models. Opening doors of a market that has already been world’s 8th in videogames and nowadays is flooded by piracy. Welcome, forcely digital distribution. By the way, you write a blog. Don’t you prefer reading Edge Magazine, much more beautiful, than this ugly pages? I don’t, because I like different medias and understand different models. oh… I do prefer Edge, actually, but I do read many blogs. Did somebody say new market strategy? What’s Igor on about? I think he just called our face’s ugly. Let’s get ‘im! For ToyTec it’s a good business model. The games will cost naff all to license (some of those mobile games have been out for a good three years already) and I expect they’ll be cheap to download too. Plus they can’t be pirated, which is a big problem in that part of the world. But what about the quality of the games themselves? They’ll either look rubbish, play rubbish or have botched controls. Or even all three. appreciation you for sponsoring the materials, a lot of riveting news. fitting-bye. This is really an interesting product. You say it’s an N-Gage, but it’s a lot more. It’s some revolution against piracy. When you understand that BRIC markets are more than 15% of the world GDP, you might rethink the need of a policy for game distribution in emerging markets. If you only think mast*rbation technology, you might want to compare PS3 with Wii and conclude that PS3 has better graphics. I want to understand Zeebo as a message for the “big platform owners”.